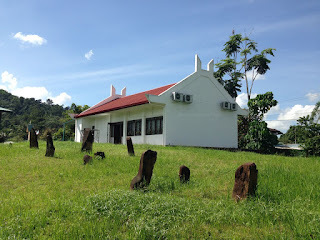 The museum with the grave markers. About approximately 11km from Kota Kinabalu and about 10-minute drive from the town of Donggongon, lies the little village of Pogunon. Pogunon was once a well-known place in the past due to its position, as it is located on the flat plains just before the Crocker range. Thus it was the gateway to the interior villages of Tambunan and Keningau. The Tamu or local market, was held here every 10 days and it was one of the earliest known tamus in existence (there is mention of it in the British North Borneo Herald: 1st July 1884). Apparently, it also had a number of early male Chinese immigrants who married the native Dusun. The various tribes from the mountains and interior would trek down to the village of Pogunon to trade. Due to this, the village of Pogunon had many wealthy inhabitants and it also boasted of many fierce headhunters. The village was a stronghold of the old religion before the arrival of European Catholic priest, who were able to convert many of the locals to the Christian faith. Almost in the centre of the village is an area which is a relic of the villages past history, as it was used as a traditional burial site. 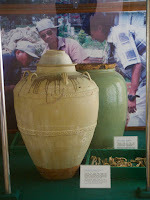 The other 2 burial jars. bodies of the deceased, used to be placed in large jars that were part of the trade goods from China. These jars were usually at least a meter in height with wide mouths. After placing the deceased body inside it in the fetal position, the mouth of the jar was usually sealed with a ceramic plate or bowl with the aid of resins from the forest. Together with the deceased would be placed funerary goods, such as their personnel adornments like silver coin belts, favourite ceramic bowls and other items. The jar would then be buried in the ground and often a large rock from the nearby river would be used as a marker on the grave. According to local folklore, rounder or smother stones were used for females while sharper sided stones were used as markers for male graves. Many of the stone markers for the graves of the warriors would have notches carved into the sides of the stone indicating the number of heads taken during his lifetime during headhunting raids. Some of the 19th century Chinese blue and white ceramics. Every now and then, especially during modern day development, one accidently comes across these burial sites. This is exactly what happened in the year 2000 during the construction of the Pogunon Village Kindergarten building. Three whole jars, pieces of four jars; blue and white plates, and bowls were unearthed during the construction. Human bones were also found in the three jars. 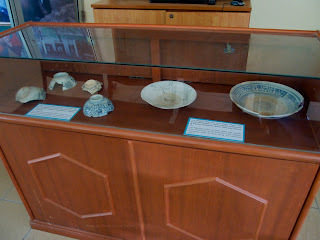 The ceramics found at the site, originated from China, and were made between the 16th to 19th centuries. A further thirteen ancient burial jars were unearthed from an old graveyard in front of the St Joseph Chapel in the same village. 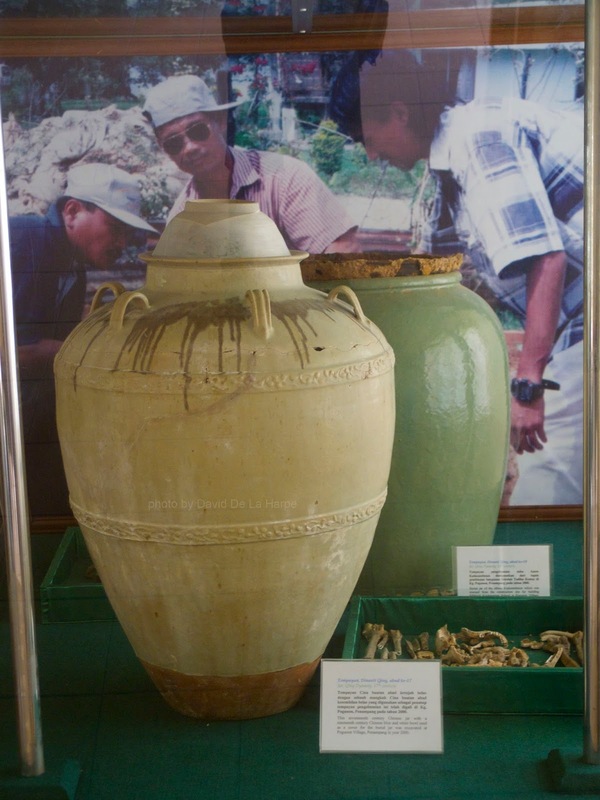 From one of the broken jars, human bones and various artifacts were found such as coins dating back to 1885, a bangle and belt (himpogot) made from ancient silver coins were also found in the jar which , sadly was broken when hit by an excavator levelling the ground. Today, this area with its hill of stone markers (megaliths) is the Site of Pogunon Community Museum.